I finally finished the Christmas edition of my tag blocks. Last year we moved two days before Christmas so there was no rush to post the blocks. This year everything go in the way and I didn't finish until today. We will enjoy it for the next three days and then next year it will get a whole month to shine. I have to admit having the Scan N Cut makes projects like this so much easier. I found the font I liked and then resized it to fit each block. I was able to set them all up on one mat and have the machine cut it all out for me. I finished the bottom block with the Stampin up set Santa's Sleigh. I fell in love with this set the first time I saw it. 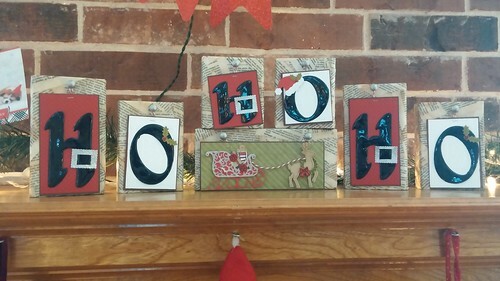 I also used some holly dies from Papertrey Ink and the Santa Hat punch from Stampin' Up.